I’ve been looking for accessories for the Circumnavigation Trip. I’m pretty sure I need a few things to dress up the Range Rover. First, I need a roof rack. I have one picked out. I think I’ll get the 50×50 rack. Its small enough to load the things I really need. It’s not terribly expensive. I couldn’t buy a welding unit and materials for what it will cost me to just buy one already made. I have thought about how I would load a canoe if I were ever to buy one. 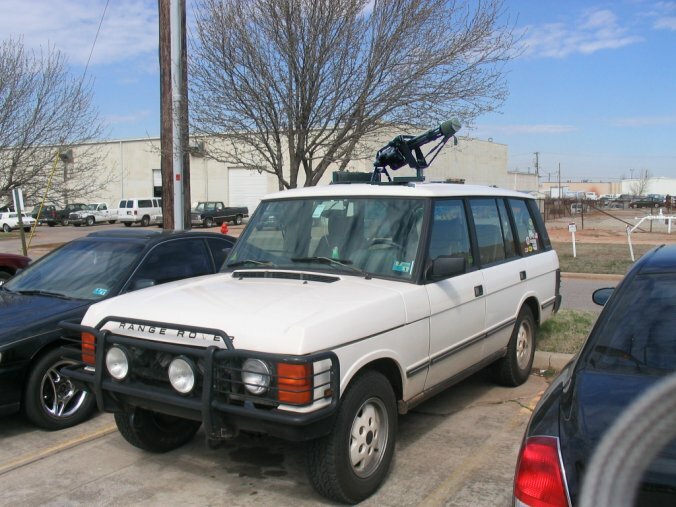 The short roof rack would not be long enough alone. I would need to add a Thule bar to finish it out if that ever presented itself as a problem. I will need some fuel cans. The natural response would be to get some “jerry cans”. They are very “Rat Patrol” like and have a cool factor of 11. I have seen some other systems that I like equally well and they would be lower profile and less apt to be stolen. This is the exact thing that came to mind when I first started thinking about auxiliary fuel tanks. My neighbor has these strapped to his ATV’s. They ride flat and are perhaps easier to mount. They can be stacked as well. Of course this would be totally awesome. 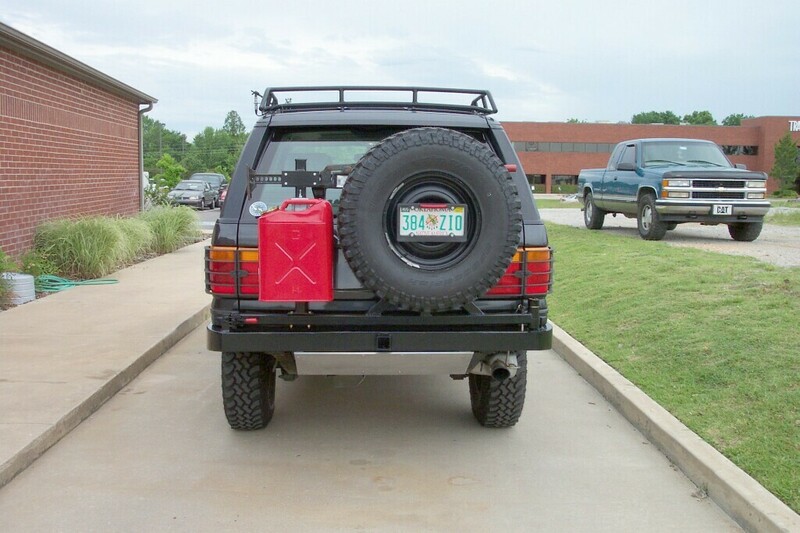 Rear bumper mounted fuel tank and spare tire. 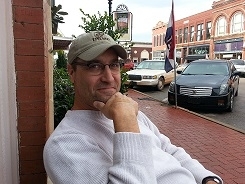 This is from Rock Rover out of Tulsa, Oklahoma. 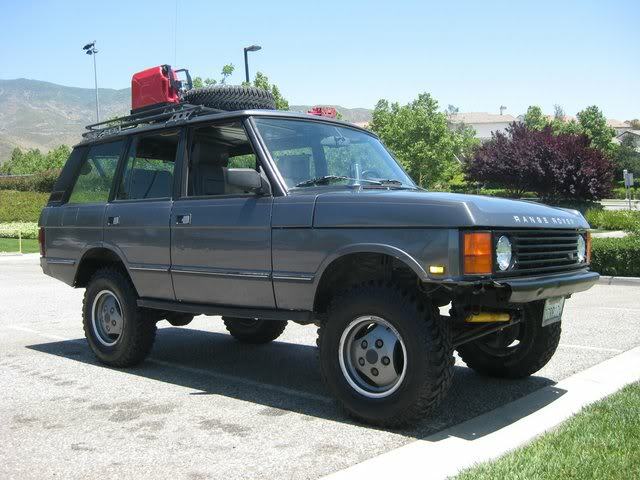 I’ve inquired about a bumper for a Range Rover Classic. I’ll let you know what they say. If they can’t do it, this looks like a good reason for me to learn to weld. Other than a ring-mounted mini-gun, I’m not sure what else I might need. Look for more posts on outfitting as we get closer to our Circumnavigation Trip. My OkieRover Facebook page got a message from Myles in OKC, he has a 1993 and wants meet up and talk Rovers…That will be fun. Always good to meet a fellow Land Rover owner. This entry was posted in circumnavigate, roof rack. Bookmark the permalink.